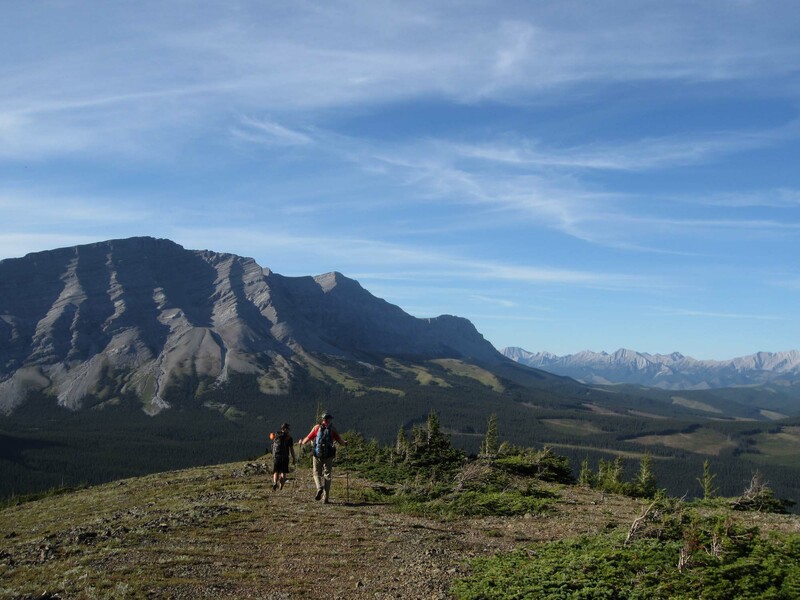 The Great Divide Trail can be beautiful and rewarding, but it can also be remote and challenging. Whether you’re just walking a few minutes from a trailhead or backpacking for several days in the Rocky Mountain wilderness, it’s important to know the basics of backcountry travel. Getting outdoors and into the wilderness is a healthy thing to do but accidents can happen and it’s important to know how to handle them. Safety is your responsibility and should be your top priority. Self-sufficiency is required so review the sections below in order to be prepared. Know your personal limitations and stay within them. Tell someone where you plan to go and when you plan to return. Check out our other Trip-Planning Resources to prepare for a journey on the GDT. For more information check out Parks Canada’s ‘Backcountry Safety’. The GDT is not officially signed and not always an actual trail, sometimes just a wilderness route so at some point, navigation will be a challenge. Always bring a map and a compass and know how to use them. Consider bringing a GPS or satellite-based communication device such as a satellite phone, SPOT or Garmin inReach. If you hike with your smartphone, consider using the GDT App. Check out our map page for a GPS-based map of the entire trail. The detailed descriptions in the guidebook can also be helpful in keeping you on track. Because weather and trail conditions are always changing, it is best to research your route from as many sources as possible; don’t rely on a single source and be prepared to improvise. A journey on the GDT promises to be rewarding but not without a few challenges. A deceptively short hiking season, summer snowstorms, difficult mountain navigation, glacial stream crossings, and remote trail exit points for resupply or potential emergency access can all seem daunting but with proper preparation and gear, you should be able to handle anything the trail throws at you. Beware of all natural hazards such as rivers and streams. Many streams along the GDT are glacial fed which means their volume can fluctuate significantly during the day. Plan to ford hazardous creek crossings early in the morning when they are at the lowest level. Monitor weather conditions and be prepared. Never underestimate the power of weather in the mountains, conditions can change very quickly so be prepared for anything. Snow can linger on mountain passes late into the summer and while infrequent, summer snowstorms can cover the trail at anytime in the Canadian Rockies. Read more about Snow on the GDT. Be aware of the locations of access points along the trail in case of emergency. Beware of all wildlife hazards and how best to avoid them. Never harass, approach, entice, touch or feed wildlife. Bears: The Canadian Rocky Mountains are home to both grizzly bears and black bears. Although the chances of having an encounter with an aggressive bear are low, proper planning before you head out can help reduce your risk. Carry bear spray, watch for fresh bear signs, and if you see a bear, back away slowly and leave the area. Never run. Fall is pre-hibernation feeding season for both black and grizzly bears which increases the chances of running into a bear on the trail. It is easy to surprise a bear that is focussed on feeding so make noise while hiking in bear territory. If approached by a bear, try to appear non-threatening, talk in a calm voice, when the bear stops advancing, start slowly moving away. If it keeps coming closer, stand your ground, keep talking, and use your bear spray. If the bear makes contact exhibiting defensive behaviour (most common), fall on the ground on your stomach and play dead, lie still and wait for the bear to leave. If the bear attacks exhibiting predatory behaviour (very rare), try to escape, do not play dead, use your bear spray and fight back. For more information check out Parks Canada’s “bear-aware” safety tips, including how to travel safely in bear country and how to use bear spray. Elk: Elk are common throughout the Canadian Rockies and caution should be taken at all times, particularly during birthing and rutting seasons. May and June is the birth season and mother elk can be very aggressive when protecting their calves. Elk rutting season is from September until mid-October. Look for warning signs that read “Attention Elk Mating” posted in areas where elk herds often gather. Be aware that bull elk become extremely aggressive during rutting season so keep at least 30 metres away from all elk and never get between a male and female elk. Raise your arms, maintain eye contact and never turn your back or run. Back slowly out of the area. If necessary, climb a nearby tree or position yourself so that a large object such as a tree or rock lies between you and the elk. Cougars (mountain lions): While rarely seen, cougars live throughout the Canadian Rockies. If you encounter a cougar make yourself look big, raise your arms, make noise, maintain eye contact, never turn your back or run, back slowly out of the area. If attacked (very rare), respond aggressively, fight back, do not play dead. Spend some time with your equipment before leaving on your trip – learn how it works, make sure it fits, and run through your checklist before leaving home. Weather and trail conditions can vary greatly on the GDT so it is important that you are prepared for the worst. Knowing the Ten Essentials is good. Carrying the Ten Essentials is better. Navigation – Always bring a map and a compass and know how to use them. Consider bringing the GDT App or a GPS or satellite-based communication device. Sun protection – Much of the GDT travels in the alpine with very little shade so protect yourself from the sun with sunglasses, sunscreen, lip balm and a hat. Insulation – Temperatures on the GDT in the summer can fluctuate from below freezing to downright hot (+30 C) so a layered clothing system is recommended. A basic 3-layer system includes (1) a thin base layer that can be used by itself in warm temperatures or as an insulating layer in cold weather; (2) a thicker insulating middle layer; and (3) a windproof/waterproof shell. All clothing should be made of synthetic material which has the best moisture transport and quick-drying characteristics, ideal for both cold and hot weather. And don’t forget a hat or toque. Illumination – Headlamp or flashlight (with spare batteries). First-aid supplies – Bring a first aid kit, including treatment for blisters, adhesive tape and bandages, gauze pads, disinfecting ointment and/or wipes, and pain medication (acetaminophen or ibuprofen). Fire – Waterproof matches or lighter and firestarter. Repair kit and tools – Knives or multi-tools are handy for food preparation, first aid, gear repair or other emergency needs. Bring repair kits for stoves, inflatable mattresses and other gear as required. Or bring the poor-man’s repair kit: Wrap strips of duct tape (the universal fix-it product) around your water bottle. Nutrition – Obviously food is essential for any journey on the GDT. Light-weight, easy to prepare, high calorie food is ideal. For multi-day treks, it is important to bring extra food in case of emergency or unforeseen delays. Hydration – On the GDT, it is recommended to have two litres of water storage capacity as well as some means for treating water (e.g. filter or chemical treatment). Plan for enough water to accommodate additional requirements due to heat, cold, altitude, exertion, or emergency. And always consult your map or guidebook for distances between available water sources. Emergency shelter – Long-distance backpackers usually carry a tent or some other form of shelter (e.g. tarp) but if you are day-tripping on the GDT, consider bringing an emergency shelter just in case. While not one of the “Ten Essentials”, footwear is one of the most important items for any long-distance trek on the GDT. You will be travelling many miles on your feet and it is critical that you take care of them. Ensure you have comfortable, broken-in boots and good hiking socks. During most of the summer hiking season (July to September), the GDT can be hiked in light-weight hiking boots. Consider bringing a separate pair of light shoes or sandals for stream crossings and to wear at camp. To reduce your campsite’s attractiveness to bears and other animals, all food and trash should be securely stored. Some designated campgrounds in National and Provincial parks have food storage cables or boxes that should be used to hang or store your food. All food, garbage, toiletries and cooking equipment should be suspended at least 4 metres above the ground and 1.3 metres from a tree or pole. Carry at least one 20 metre length of rope along with you. Do not wash yourself or your dishes in streams and lakes. Carry the water to your campsite and wash there. Dispose of grey water on land, well away from water sources and campsites. Wildfires are a common occurrence in the Canadian Rocky Mountains and occasionally result in sections of the GDT being closed. Unfortunately about half of the wildfires in the Canadian Rockies are started by people but this is preventable. It is trail users’ responsibility to get up-to-date fire restrictions for the area of the GDT they are traveling through; further, it is imperative trail users abide by fire restrictions to reduce the potential for wildfire. Check out BC’s Wildfire Management website and Alberta’s Wildfire Management website for current status of active wildfires and the latest information on fire bans and fire danger ratings. Check our Trail Update page for the latest trail closures related to wildfires. Campfires are prohibited in many backcountry areas, particularly those containing alpine and sub-alpine areas, or other sensitive environments. When in doubt, avoid building a campfire. Use portable gas stoves for cooking instead of campfires whenever possible. Designated campgrounds in National and Provincial parks with metal fire grates or rings. Random camping sites below the treeline. Use pre-existing fire-rings or pits whenever possible. Prepare your campfire location by removing all leaves, twigs and other flammable material and scraping or digging down to the dirt in an area extending at least 30 centimetres around the fire. Keep fires small. Backcountry campfires should not be larger than 0.5 metres in height and 0.5 metres in diameter, or roughly a foot-and-a-half by a foot-and-a-half. Equip yourself with a shovel or a large container of water and keep near the fire at all times. Use only small pieces of fallen dead wood as firewood. Do not cut down live tress for firewood. Do not burn garbage. Never leave a fire. Fires must be attended at all times and completely extinguished before going to bed or leaving the campground. Soak it, stir it, soak it again. If applicable, purchase a permit. Campfire permits are required in National Parks. The GDT is not designed, nor intended, for snow travel. When the trail is covered in snow, finding it may be impossible. You’ll have to be an excellent navigator to follow the trail corridor when it’s covered in snow. Hiking on the GDT when it’s snow covered means exposing yourself to potential avalanche risk. In many places, it’s unwise to travel the trail during these conditions. While planning your hike, research snow conditions and check out the Canadian Avalanche Centre for the latest avalanche bulletins. in BC, check out the Snow Survey and Water Supply Bulletins or the Automated Snow Weather Station Map. in Alberta, check out the Alberta River Basins map (turn on the snow pillow layer). Minimize your impact on the trail and its surrounds. Always practice Leave No Trace principles when travelling on the GDT. To retain the high quality of our wilderness experiences, we all must accept responsibility for minimizing our impact. Leave No Trace Principles are utilized by the Great Divide Trail Association. Obviously performing trail work can result in “leaving a trace”, these principles are designed to help us minimize our impact on nature. Please do your part by reviewing and applying these principles whenever you are traveling and staying outdoors. 1. Plan ahead and prepare. Outdoor users can increase their level of safety and comfort as well as minimize damage to nature by planning ahead and being prepared for the terrain and weather conditions that will be encountered. Users need to be prepared for all weather conditions and have adequate gear including clothing, boots, shelter, water, and food. 2. Travel and camp on durable surfaces. A primary, identifiable trail provides a route that concentrates outdoor users and minimizes the impact to the area. Trampling can occur when users depart from this trail. The resulting barren area can lead to erosion and with consistent use the area will be unable to recover. When traveling users should avoid shortcuts and walk in a single file in the middle of the marked trail even when wet or muddy. Choose the most durable surfaces such as sand, gravel, rock, dry grasses, or snow when traveling and camping. Protect riparian areas by camping at least 50 metres from the edge of a stream or lake. 3. Dispose of waste properly. Be informed about proper waste storage and disposal. A good rule is: pack it in, pack it out. Leftover food needs to be properly sealed and stored away from the tent. If latrines are unavailable, human waste will need to be disposed of in catholes 15 to 20 centimetres deep in the soil and at least 70 metres from a water source. Toilet paper and hygiene products need to be packed out. To wash dishes or yourself, water needs to be carried at least 70 metres from the water source. Strained dishwater should be scattered. You can also practice “negative trace” by picking up trash that others may have left behind. 4. Leave what you find. Preserve the present and the past. Leave rocks, plants, natural objects, and historic and cultural artifacts as you found them. Take pictures instead! Do not dig tent trenches or hammer nails into trees. Replace rocks and twigs that you may have cleared when setting up your campsite. Avoid introducing or transporting non‐native species by keeping your boots and gear clean of hitchhiking seeds. 5. Minimize campfire impacts. Natural areas have become increasingly degraded with an overuse of fires and increased demand in firewood. Alternatively, a lightweight stove can be used for cooking and a candle lantern or headlamp can be used for light. If fires are permitted they should be limited to fire rings, fire pans, or mound fires. They need to be kept small and made from sticks found on the ground that can be broken by hand. Campfires need to be extinguished completely and the cool ashes scattered. 6. Respect wildlife. Wildlife need to be quietly observed from a distance. Users should not follow, approach, or feed them. During sensitive times (mating, nesting, raising young, winter) wildlife should be altogether avoided. Storing food, scented personal items, and trash in secure locations can help protect the user and the local wildlife. 7. Be considerate of others. All users have the right to an enjoyable outdoor experience. Courtesy and respect toward fellow‐users help protect the quality of their experience. Yield to other users on the trail, step to the downhill side of the trail when pack stock are passing, and camp away from the trail and other visitors. Let nature’s sounds prevail by avoiding loud and obtrusive voices and noises. Because cell phone service is very limited and unreliable in the backcountry of the Canadian Rockies, an option for GDT hikers is to use a satellite-based communication device. Depending on your location, help may be a long time getting to you so be prepared to self-rescue and to keep yourself and your partners warm and sheltered during the time it takes for a rescue team to reach you. Additional National Park emergency information can be found here, including how to use a Garmin inReach in a National Park.